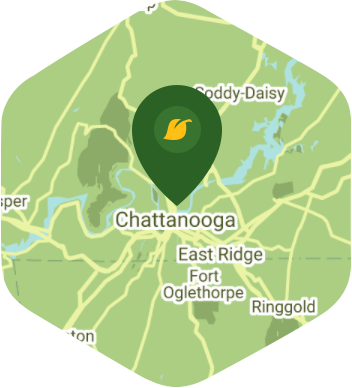 Book a skilled lawn pro in Chattanooga. Backed by a total satisfaction guarantee and amazing customer support. Chattanooga, TN is a pretty popular destination for vacation goers because of its numerous attractions. Places like the Tennessee Riverpark, Tennessee Valley Railroad and Coker Tire Museum get a ton of visitors, but you're familiar with all of them because this city is your home. Living in a place that provides you with a ton of options during your free time can be fun, but not if your yard is in dire need of your attention. Having to cancel your weekend plans to do yard care work is no fun, but luckily for you Lawn Love is here to save the day. We offer quality yard care to the proud homeowners of Chattanooga, and we'd have no problem working on your yard so you can enjoy your weekend. We know how hard you work all week and don't want your weekends to be filled with even more work, so just leave the yard care to us and go do your thing. Our independent lawn pros will work hard to make sure that your yard gets taken care of properly. They are highly experienced and have the technique and equipment to get everything done. If you want to see how great our yard care service is, call us at 423-443-3261. You can also ask for a free online quote. Brad did a great job with our yard. Very professional and a good communicator. We highly recommend him. Made a rough yard look loved. Looked great! Very professional, tackled a big hill and still continued with a very friendly attitude! She has done a great job both times we have used lawn love. It is very nice to have someone dependable. SHANNON WAS GREAT! THE YARD LOOKS AMAZING! THANK YOU SHANNON!!!! The yard looks GREAT! However, I would love, for future services, to include the bushes trimmed, alongside the fence, by my driveway Other than that, she did an AWESOME JOB! Shannon did an excellent job! Thanks! Rated 4.89 / 5 stars in 35 Chattanooga customer reviews. There won't be any rain in Chattanooga today, which means you'll probably have to water your lawn. Dusk and dawn are the best times to water your lawn (the sun will rise at 7:03 AM and set at 8:17 PM today in Chattanooga). Here are some average lawn care prices for homes in Chattanooga. Average lawn size 7,794 sq. ft.